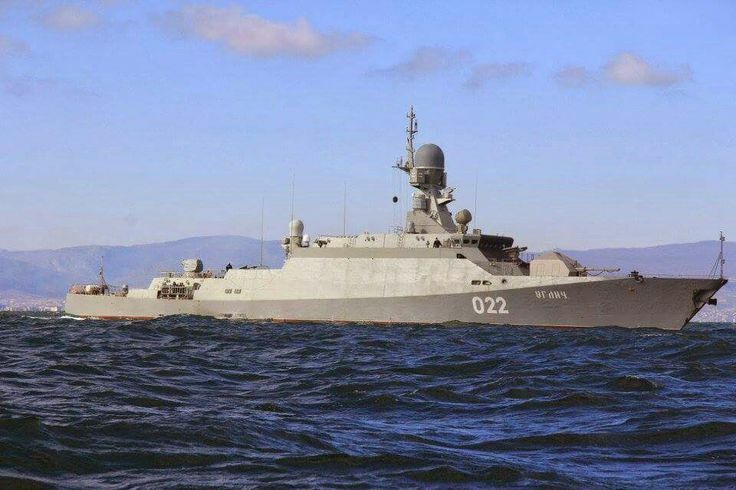 Project 21630 Buyan Class corvettes are in service with the Russian Navy. 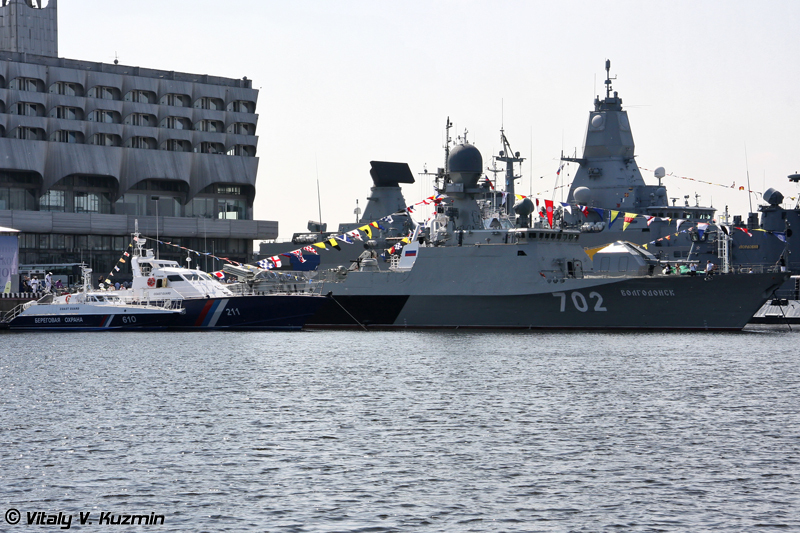 Three Buyan Class corvettes were built by JSC Almaz Shipbuilding in St. Petersburg. The vessels serve the Caspian Flotilla of the Southern Military District. Buyan Class corvettes can conduct maritime patrol missions along the 200-mile maritime economic zone of Russia. The ship can perform missions in shallow waters and river mouths, particularly for delivering troops directly to land. The keel for the first corvette in class, Astrakhan, was laid down in February 2005 at Almaz Shipyard in St. Petersburg. The ship was commissioned into the Russian Navy in January 2006. Volgodonsk was launched in May 2011. It was demonstrated to the public during the International Maritime Defence Show (IMDS-2011) in St. Petersburg. The ship was delivered in December 2011 and commissioned into the Russian Navy in June 2012. The third and the last ship in class, Makhachkala, was laid down in March 2006 and launched in April 2012. The delivery of the ship was delayed due to the installation delays of the 100mm gun mount. Makhachkala completed state sea trials in October 2012. The ship was delivered to the Russian Navy in December 2012. It was commissioned into Caspian Flotilla in February 2013. 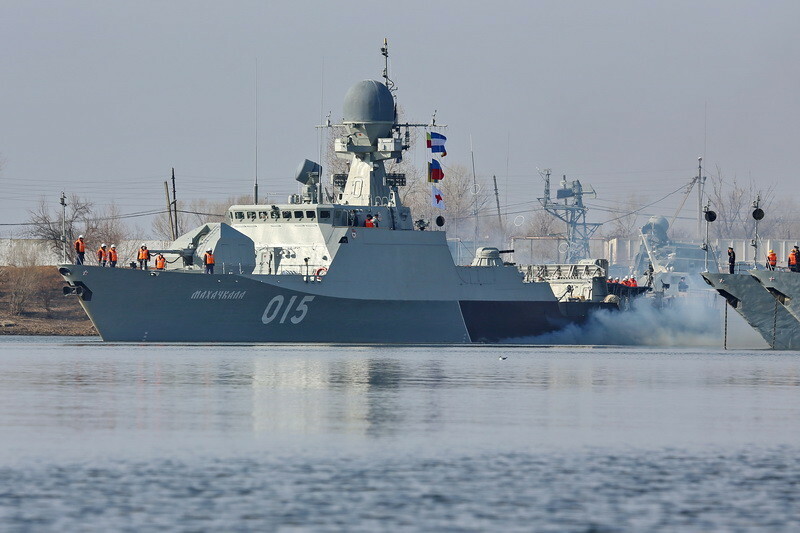 Project 21631 (Buyan-M) corvettes, the missile variants of Project 21630, are being constructed at the Zelenodolsk shipyard. The new vessels are expected to be equipped with missiles, artillery weapons and electronic countermeasure equipment. An export variant known as Project 21632 Tornado is also being proposed. According to state television news (broadcast of 11.10.2015), launch of production took place in 2012. Details of this version – the maximum speed of Mach 3, the range of 4,000 km, basing in the air, on land, on water and under water (shows launch from water depth). The missile can make in-flight maneuvers 147 times or more (in any direction), the minimum height of 10 meters, an average of 20 – 50 meters (up to 1000), it will automatically follow terrain, the missile can be controlled in flight. 3M-14/3M-14T: 2500 kmlong range variant: 4000 km? “By the end of 2019, the entire series of these ships will be built, which is about 10,” Bursuk said, speaking on the Rossiya-24 television channel. 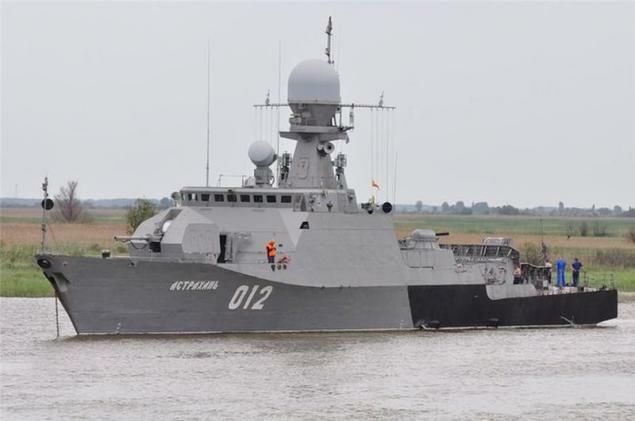 Buyan Class is a river-sea type corvette designed by Zelenodolsk Design Bureau. The design incorporates stealth features to reduce the radar cross section. The flexible open architecture of the ships allows for modifications according to the future requirements. The ship has a length of 62m, beam of 9.6m and a draft of two metres. Buyan Class has a displacement of about 500t. Each vessel can accommodate a crew of 29 to 36. The main gun fitted on the bow deck is a single A-190 100mm cannon. Close-point defence is provided by two AK-306 30mm close-in weapon systems. The ship is also armed with A-215 Grad-M naval multiple launch rocket system. The system can fire up to 40 122mm rockets against onshore targets. Burevestnik manufactures two variants of 100-mm А190 Lightweight Multipurpose Naval gun: А190E and А190-01. 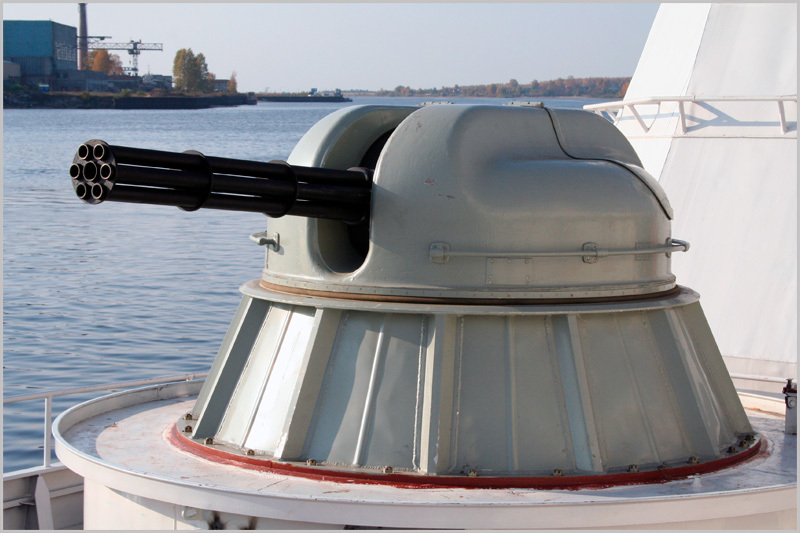 100-mm А190 Lightweight Multipurpose Naval Gun is a single-barrel turreted automatic gun that may be installed on ships with the displacement of 500 t and more. Upon the operator’s command the fire control module automatically turns the artillery system to standby or combat-ready position, ensures ammunition selection and feeding, gun laying and firing. As a result, the artillery system has minimum response time and high rate of fire. А190 Naval Gun can fire HE (impact fuze) and AA (time fuze) case ammunitions. – fast reaction (2…5 sec) to counter air threats. Quick shift of fire when engaging multiple targets. Design of the AK-630 (A-213) gun system started in 1963. The first prototype was made in 1964 and trials were conducted until 1966. The trials of the complete system with radar and controls went on until 1976 when the system was accepted for service. Production started in 1969 in Tula, with a modified AK-630M (A-213M) system accepted into service in 1979. These systems are the main close-in defense systems on modern Russian ships. The gun itself is a 6 barrel Gatling gun designated as AO-18. The barrels are in a single block, having exhaust-driven joint automatics. They are belt fed with a flat magazine in the AK-630 and a drum magazine in the AK-630M. These weapons form a part of a complete self-defense system called A-213-Vympel-A, which includes gun, radar, optical and TV control systems. A single MP-123 Vympel system can control two 30 mm guns or one 30 mm and one 57 mm gun. This system can engage air targets at ranges up to 4,000 m (4,400 yards) and surface targets at ranges up to 5,000 m (5,500 yards). The TV control system can detect MTB sized ships at the distance of 75 km (40 nm) and the fighter-size air targets at 7,000 m (7,600 yards). This system is completely automatic and does not require human supervision although it can be directed from optical control posts in case of damage or for firing on shore targets. The AK-306 (A-219) system was a modification of the AK-630 (A-213) system for use on light ships, like air cushion craft, ekranoplanes and small displacement motor boats. Externally, there was no difference between AK-306 and AK-630 guns, but internally instead of using the exhaust to power the automatics, the AK-306 (A-219) used electricity. This version also lacked radar control, being only optically guided, hence making it less of a anti-missile weapon and more of a surface-to-surface weapon. The design started in 1974 and the system was accepted into service in 1980. By 1986, 125 systems were in service. 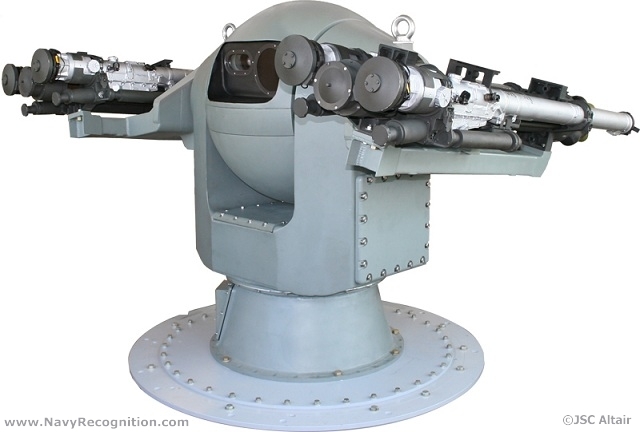 30-mm shipborne automatic double-gun mount is designed to be used as a component of gun system with different radar and optoelectronic control systems. It is intended for arming the ships and fire emplacements on the coast with the main missions to hit pilotless and piloted air attack means, including aircrafts, helicopters and low-flying anti-ship missiles, to destruct small-size seaborne targets, unarmored and lightly armored shore-based targets as well as to fire buoyant mines. Depending upon missions to be solved, firing can be conducted by both automatic guns simultaneously or by each gun separately. • Digital electric drive serves as a system of laying drives. • The gun mount may be used as armament of stealth ships. • As to the points of turret unit attachment and overall dimensions of underturret compartment, AK-630M-2 DUET gun mount is unified with AK-630M gun mount. The BM-21 Grad (hail) multiple launch rocket system entered service with the Soviet Army in 1963. It was produced for a long period of time in large quantity both for the Soviet Army and for export customers. Currently the BM-21 Grad is in service with more than 30 countries. It is the most widely used artillery rocket system in the world. There are numerous variants, copies and modifications of this vehicle. The BM-21 Grad has 40 launching tubes for 122-mm rockets. The standard rocket with a HE-FRAG warhead is 2.87 m long and weights 66.6 kg. Warhead itself weights 18.4 kg. It also fires rockets fitted with incendiary, chemical, smoke, illumination or cluster warheads. Cluster warheads contain anti-tank or anti-personnel submunitions. A number of specialized warheads were developed for this vehicle. A full salvo of the BM-21 Grad covers area of 0.8 -1 hectares. The air defence capabilities are complemented by a four-tube 3M47 Gibka naval missile launcher firing Igla or Igla-S anti-aircraft missiles. The ship also houses gun mounts for 14.5mm and 7.62mm machine guns. The 3M-47 Ghibka turret was designed by Altair Naval Radio Electronics Scientific Research Institute and is manufactured by the Ratep Joint Stock Company. Ghibka 3M-47 (3M47 Gibka) Turret Mount is intended for guidance and remote automated launching of IGLA type missiles to provide protection of surface ships with displacement of 200 tons and over against attacks of anti-ship missiles, aircraft and helicopters in close-in area.. The turret mount utilizes information from ship’s radars. The missiles are equipped with homing head with optical tracking (passive) and artifical thermal noise detector. The system is design to resist natural (background) and artificial jamming conditions. The turret mount is equipped with 9M39 and 9M342 anti-aircraft guided missiles. To date, 3M-47 Ghibka is installed on Project 21630 “Buyan” class corvettes, Project 21631 “Buyan-M” class missile corvettes and will be installed on the future Mistral type LHD for the Russian Navy. The turret is remotely operated and can be steered towards targets detected by the Positiv, Furke or Fregat naval radar systems. Final aiming is achieved at the control module through a TV sighting system. According to constructor specifications, the visual detection range of an aircraft through the control module is 12 to 15 Km. An important feature of the ships “Tornado” type that they can equally well operate in shallow waters (their maximum draft is less than two meters) – on navigable rivers, in their mouths, in archipelagic and other “narrow” the waters and on the high seas . This is due to the fact that the IAC Project 21630 designed for operations in shallow Caspian Sea, known for its fierce storms. The single platform ships such as “Tornado” has a total displacement of 560 tons, length – 61.45 m, width – 9.6 m diesel engines. MTU 16V4000M90, working on CODAD scheme allows to develop 26 knots full speed, and water jets provide high maneuverability and move in shallow waters, reducing noise and vibration of the chassis. The ships are widely used stealth-technology, giving it low visibility. Thus, the inclined flat surface superstructure and turret, bulwarks contribute to scattering of the reflected radar waves and reduces their intensity, ie secondary radar field of the ship. The layout of rooms and corridors contribute to the free movement of personnel on the ship without going to the upper deck. An alarm every officer and sailor can quickly take their place in combat schedule. Cruising range “Tornado” in the form of small artillery ship – 1500 miles, endurance – 10 days. Navigation system and means of hydrometeorological, combat information and control system “Sigma-E”, integrated bridge systems fully meet current standards and allow to solve assigned combat missions in full, as well as to safe navigation. 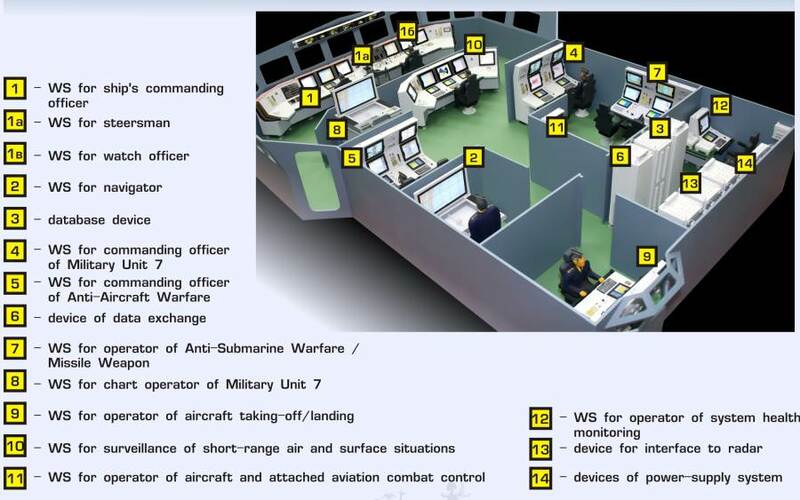 The main link in the ships electronic equipment is a combat information management system “Sigma-E”, which provides command and control vehicle by combining the electronic equipment in a single complex automation of the process and the decision-making on the use of the ship’s combat arms. With the possibility of forming information on the tactical situation for the ship and for tactical formation, any of the ships of the “Tornado” can act as a control ship. Due to the wide introduction of automation, the number of the crew depending on the modification of 29-36 people. The Uran missile systems comprise 16 Kh-35 missiles – 4×4 launchers with pressurised transport-launching containers. 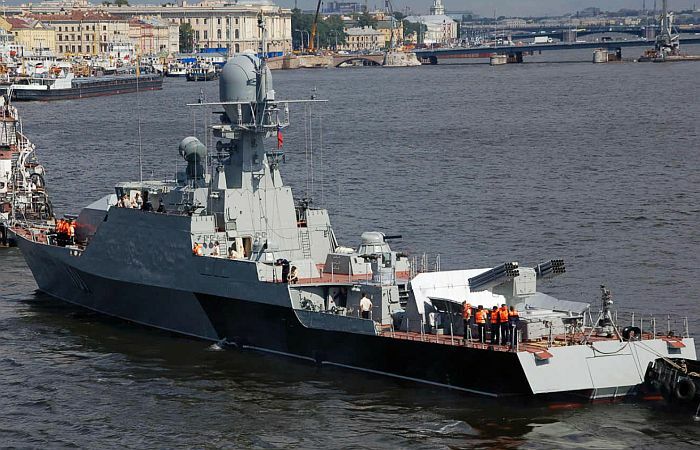 The Uran system now serves as armament of Project 1149.8 missile equipped gun boats and other vessels. A coastal defense variant and, more recently, an antiaircraft variant were later developed on the basis of this missile.The Kh-35 missile has a normal aerodynamic design and an aluminium-alloy airframe. The missile’s power plant consists of a solid-fuel booster and a turbojet powerplant. The missile’s take-off weight is 750 kilograms, the warhead weighs 150 kilograms with a range of up to 130 kilometres. The Kh-35U anti-ship aircraft missile (Article 78U), propelled by a turbojet engine, flies toward its target at a speed of about the 300 m/s at an extremely low altitude. Owing to its high-precision radio-altimeter, the missile can skim the sea waves at an altitude of 3-5 metres at the terminal phase of trajectory. Its guidance system combines inertial guidance for during the initial flight stage and active-radar guidance during the remaining flight stage. 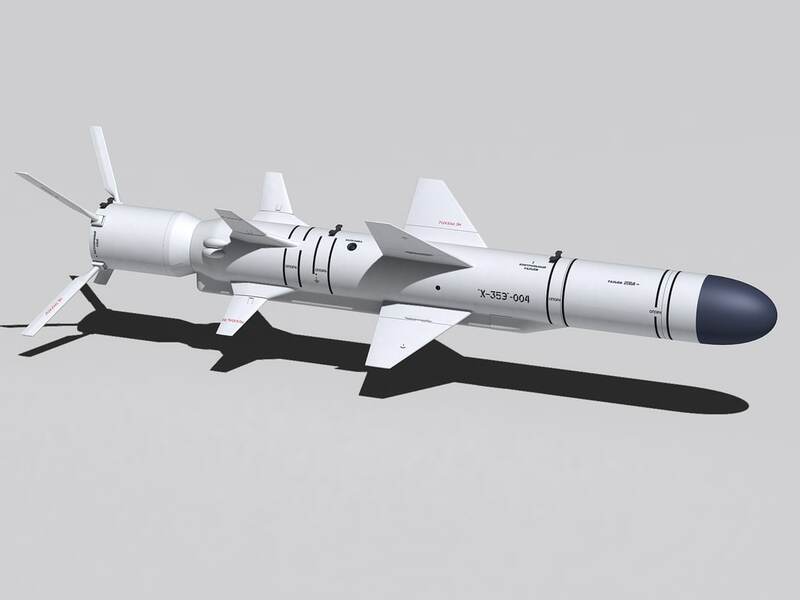 The missile has a folding wing and a folding tail fin.For use by coastal or shipborne launchers the missile is equipped with a rocket starter-accelerator, a container-type launcher having room for four missiles. The corvette features better see-keeping capabilities for navigation in stormy conditions. Buyan Class corvettes operate at up to sea state six and can employ weapons at up to sea state four. Buyan Class integrates Pozitiv-M air / surface search radar, MR-231 navigation radar and 5P-10 Laska shipborne radar gunfire control system. The electronic warfare aboard the Buyan Class includes two PK-10 shipborne decoy launching systems mounted on either side of the stern behind the superstructure. The PK-10 is a close-range decoy dispensing system designed to enhance the self-defence capability of the vessels. 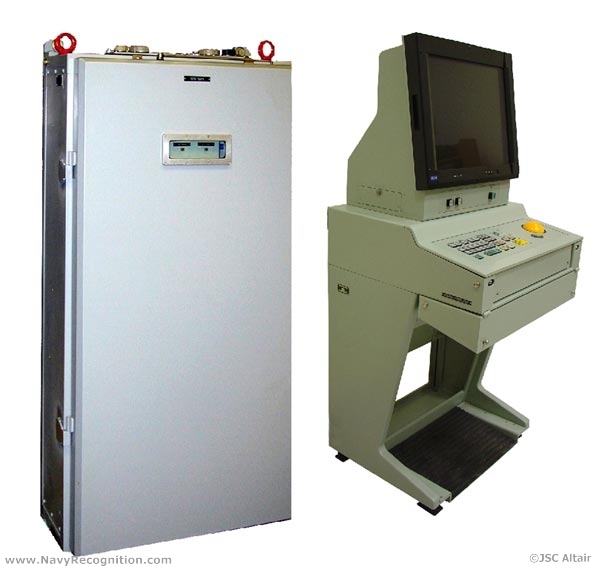 The system can launch up to ten electronic and optronic decoys to deceive the incoming anti-ship missiles. crew training in simulated tactical situation. scanning radars for the ships of various classes, as well as for land mobile platforms, stationary facilities and transportable containers. Sector width by elevation up to 85 deg. up to 85 deg. Output of surface and air target designation data to missile firing control systems, torpedo and artillery systems, as well as to jamming systems. acquisition and lock on the attacking missile launched from the tracked target with solution of the engagement priority problem. Laska fire control radar is designed to monitor surface/air situation and to control fire of 30mm-76mm close-range shipborne artillery systems against air/missile and small-size surface targets. 5P-10-03E General-Purpose Small-Sized Radar Control System is designated for optimal fire control of 30-100-mm naval artillery gun and 120-300-mm MLRS within the surface ship’s area of operation to ensure air and missile defence mission execution, warfare against small enemy surface ships, coastal target engagement, surface and air surveillance. assessment of target threat level and fire control of one or two naval guns engaging one or two tracked targets; intercept of a missile taking off from the tracked target with shift of fire to the missile. Automated simultaneous fire control of several naval artillery guns engaging one or two air, sea or coastal targets. The system is installed on small and medium displacement surface ships (not more than 150 tons). When engaging targets providing for 0,1 m² radar crosssection and 700 m/s speed in the autonomous mode, the balanced anti-aircraft warfare is provided by the effective engagement range of 30-100 mm antiaircraft naval artillery guns. Buyan Class is powered by a twin screw combined diesel and diesel (CODAD) propulsion system. The propulsion system consists of two Zvezda M520 radial 56-cylinder diesel engines driving two pump-jet propulsors. The propulsors, with reduced noise and running vibration, provide high manoeuvrability. Each engine delivers a maximum power output of 3,970kW at 2,000rpm. The engine is comprised of seven banks of eight cylinders. The usage of aluminium castings reduces the weight of the engine. A crankshaft driven supercharger provides boost pressure to the engine. The supercharger is equipped with water chilled inter-cooler. The propulsion system provides a maximum speed of 28kt and range of 1,500nmi. The Buyan Class corvettes have a mission endurance of ten days. 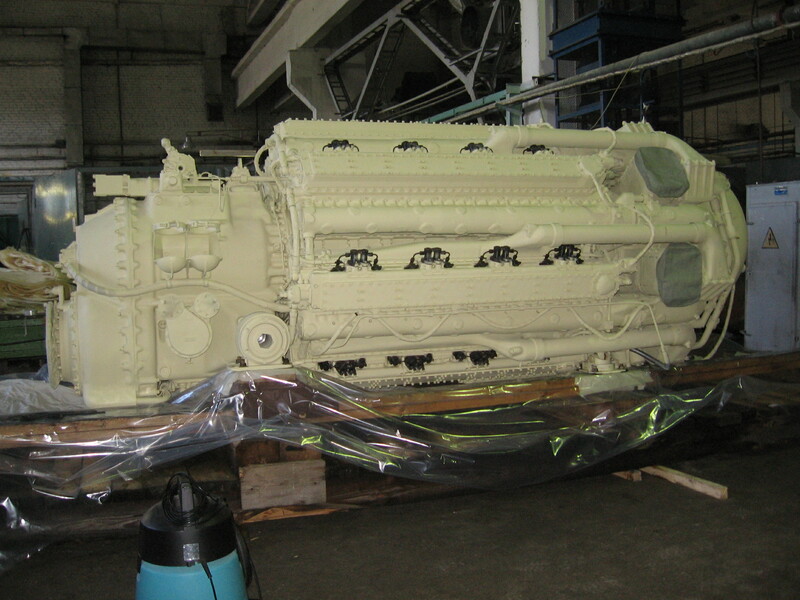 Propulsion: 2 shaft CODAD, 4 x Zvezda M520, 14,584 shp (10,880 kW), Pumpjet. This entry was posted in Uncategorized on June 17, 2016 by nonothai.